Although renaming your drawings is not mandatory, it can prove useful in maintaining a clear node structure for your project. If you leave your drawing as is and do not rename it, your deformation subgroups could become slightly confusing. If you plan to have several drawings using the same rig within an element, for instance, drawing substitution, then you should rename these extra drawings before starting your rig. In the Xsheet view, locate the column that corresponds to the element which includes several drawings that will use the same chain, such as a character that has several costumes which you plan to swap by using drawing substitution. 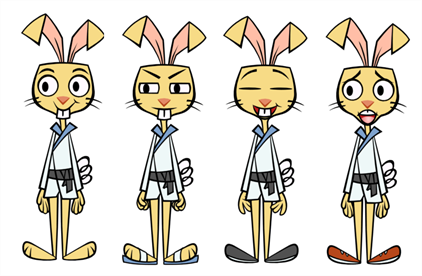 In our example, we will use the rabbit’s feet, which will all use the same deformation curve. 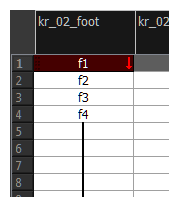 In the Xsheet view, select the first drawing of the column. This is the one that will be rigged. From the Xsheet menu, select Drawings > Rename Drawing or press Ctrl + D (Windows/Linux) or ⌘ + D (macOS). In the Rename Drawing dialog box, type a relevant new name for the drawing and click OK. In the Xsheet view, select the next drawing in the column and select Drawings > Rename Drawing from the Xsheet menu. In the Rename Drawing dialog box, type the same name that you gave the first drawing of the column, exactly as it is written and add and any number. For example, if the first drawing is named front, the subsequent drawings are named: front_1, front_2, front_3, etc. Repeat steps 5 and 6 for each subsequent drawing that needs to be renamed.